There has been a lot of misinterpreted nutritional information that we have grown up with. Most of my contemporaries have grown up avoiding eating too many eggs for fear of increasing cholesterol levels. Fortunately these fears are unfounded and eggs consistently increase HDL (the good cholesterol) and most people don’t see an increase in the LDL (bad cholesterol) or total cholesterol. In fact it is the regular high carbohydrate diet that sees more abnormal cholesterol levels as most cholesterol comes from endogenous production than from the diet. High carbohydrates that are not utilized immediately would be stored as fat. Eggs are a really cheap source of protein. In our world, cheap and processed carbohydrates line supermarket aisles. Paradoxically it costs more to eat healthily and to choose fresh food. Most people envisage low carbohydrate diets as lots of meaty roasts but the truth is that it is possible to use cheaper sources of protein like eggs. In Asia, tofu is also a quick and easy source of cheap protein and it is possible to eat low carb cheaply. E is a good friend who travels extensively and is always on the lookout for food items that are hard to find in Singapore. Singapore is getting more cosmopolitan and it is wonderful how rare items like truffle oil are getting more common. This time he brought back a tray of duck eggs from KL. Interestingly duck eggs are not available in Singapore and it is rooted in obscure reasons. Makansutra states that it is as simple as local farmers not wanting to go through the onerous process of applying to AVA to rear ducks here. Which is quite a pity because duck eggs have a greater depth of flavour and a hint of gaminess. Eggs en Cocotte is nothing more fancy than baked eggs. They are usually baked in an oven in a water bath. I usually find this cumbersome and messy especially since I am pretty klutzy and usually make a mess, and I find it a bother to boil water and pour it into the pan and trying hard not to scald myself. The Instant Pot is a brilliant solution and it literally takes only 2 minutes of pressure cooking time. Amazing. Eggs en Cocotte can be flavoured any way you want. I think my best flavour combination was with Japanese spicy roe Mentaiko. Other great additions are truffle oil and anchovies. Today I worked with whatever I could find in the fridge – mushrooms and anchovies. I sautéed the mushrooms and anchovies for a nice umami base for the egg. I love my 6qt Instant Pot but this was one of the moments where I had a moment of 8qt envy as I had to precariously perch the 5th cocotte on the edge of 2 bowls as there was not enough space on the trivet. 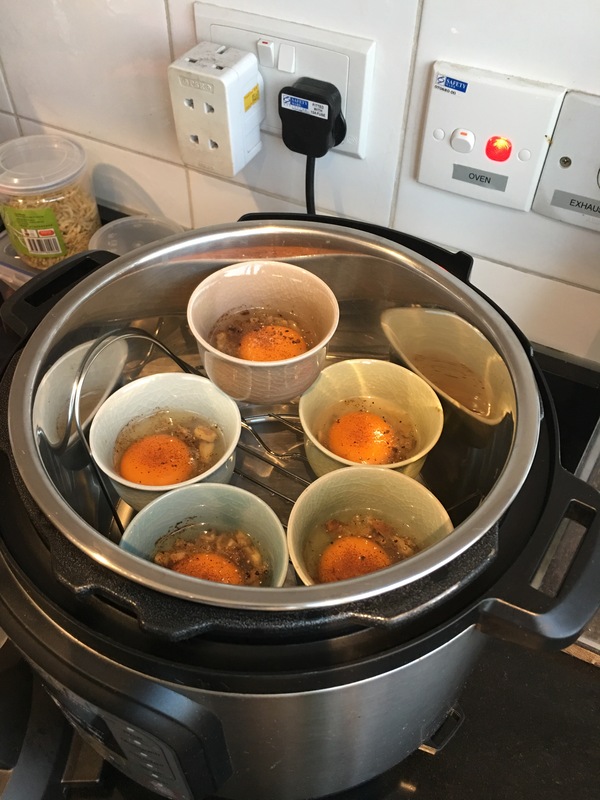 That cocotte’s egg was a little more jiggly than the others which shows that the cook zone is different in different parts of the Instant Pot. Verdict? Quick, simple and clean cook. Amazingly easy to make and a great start to a busy Sunday morning. Finely mince the garlic, and dice the anchovies and mushrooms. Heat up the butter in a pan over moderate heat. Sauté the garlic for 1 minute, then add the anchovies and mushrooms. Add the dried crushed red peppers and sauté another 1-2 minutes till the mushrooms are just cooked. 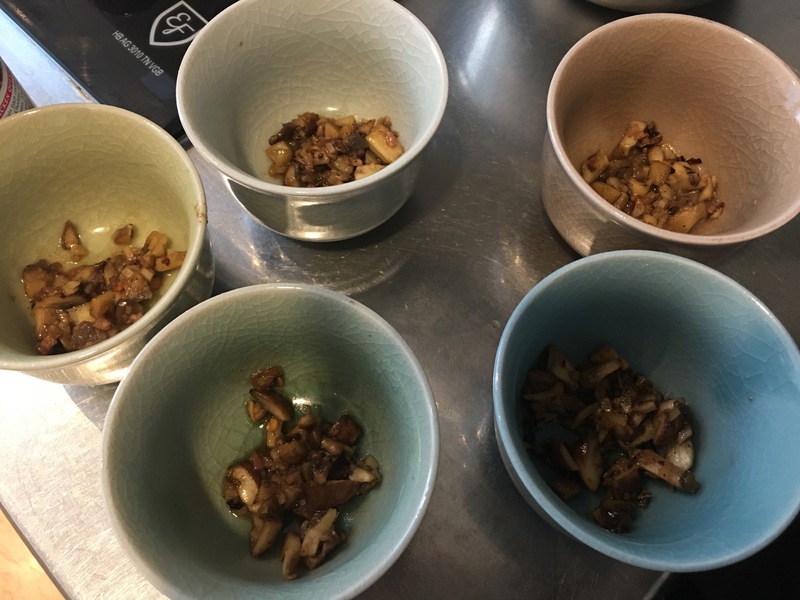 Spoon about a teaspoon each of the mushroom mixture into the bottom of 5 ramekins. Add a tbsp of cream over the mushroom mixture. Carefully crack each egg into individual ramekins. Sprinkle a pinch of salt, pepper and smoked paprika over the eggs. Place a trivet at the bottom of the inner pot and add 1 cup of water to the pot. Place the ramekins on the trivet. Seal the pot and put the Instant Pot on manual low pressure for 2 minutes. Do a quick pressure release. Top with the chives and serve hot.